It’s a well known fact that I’m lazy. When it comes to doing things for myself or anything without a set deadline or schedule I will most certainly put it off. For instance, I told Christoph I’d fix his jacket in time for winter. That was last summer. Recently, I just started learning how to drive…7 years after I said I’d do it (and I’m only doing it because my permit is about to expire). My point is that I’d like to blog more but I often put it off since I don’t have a set schedule or deadline and such. If this was my full time job I’m positive that I would blog at least once a week and focus all my energy into each post. But, before I started blogging I really never realized how much time and effort goes into one post. The process of coming up with an idea, looking at recipes, creating a recipe, baking, cooking, cleaning, setting up, finding props, making props, finding proper lighting, taking photos, taking more photos, cleaning up, editing photos, choosing photos, thinking of something to write, writing something interesting, posting photos to food websites, etc. is a lot of work! Which reminds me, I need to work on organizing the dozens of cookbooks I keep on buying. I guess I’ll get to that one day. This year for Mother’s day I was requested to make macarons instead of making the usual brunch. Seeing as it was snowing outside it probably wouldn’t have been so nice to have a backyard patio brunch anyway. Yeah seriously, snowing a few days after I was getting a tan in my backyard. Luckily, the weather is back to normal and I can sit here on my patio sunning my seriously pale legs. I was planning on making lemon macarons but at the last minute added passion fruit puree to the curd and it was delicious. Also, what’s great about filling macarons with this curd is that you’ll be able to use up your left over egg yolks after making the macs. Good thing too, cause I’m sure I’d just leave them in there for days telling myself I’d use them later. Add all ingredients except for the yolks to a heavy bottomed medium sized pot. Simmer on medium high heat while whisking constantly for about a minute till the mixture has thickened. Temper the egg yolks by adding a few spoonfuls of passion fruit mixture to the yolks and whisking quickly. Keep adding a few spoonfuls at a time until the egg mixture is warm. Add the egg mixture to the pot and quickly whisk in to prevent the eggs from scrambling. Keep whisking for a couple more minutes until the mixture is very thick. Transfer to a heat proof bowl and cover the surface of the curd directly with plastic wrap to prevent a skin from forming. 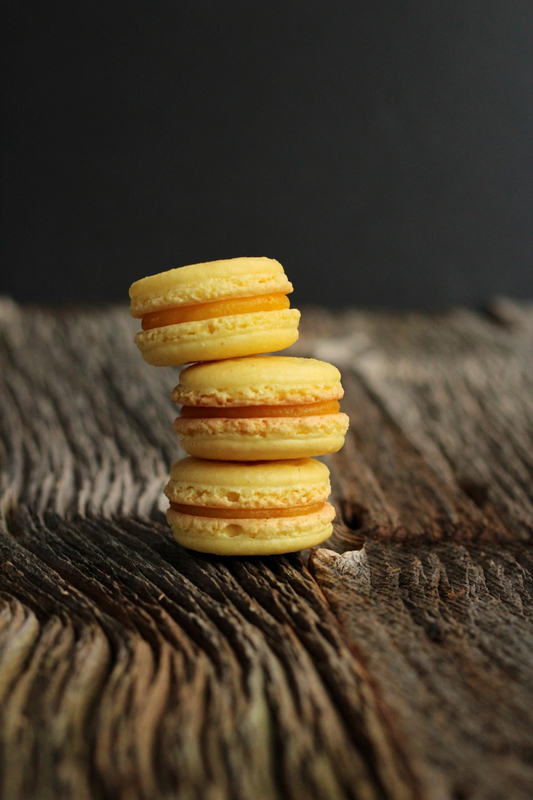 To assemble the macarons, fill up a plastic piping bag with the curd and pipe about a teaspoons worth of curd onto half the macaron shells and sandwich with the other half. Refrigerate in an airtight container until ready to eat. They will keep fresh for a few days. Want to be healthy? Eat my cookie. Lately I’ve been on a bit of a health kick. I’ve been drinking green juices, eating quinoa, chia seeds, buckwheat groats, almond milk, taking my vitamins, and exercising…sort of. Yes I’ve been doing this to be healthier but also because I have a mysterious skin condition that started a few years ago. I recently realized that the steroid creams I’m using haven’t been doing any good for my skin or my health. So within the next few weeks I plan to make a change. I’ll be going to a naturopath to see what they think is best for my condition and hopefully I’ll be able to blog about it if I see any changes in my skin and my overall health. Oh, and hopefully I’ll be able to stick to it and not lose it when I see those amazing black forest doughnuts at my favourite doughnut shop! But for now I’ll be eating these cookies. Not that I’m saying they’re gross or anything compared to the doughnuts but they’re just in a different category of sweets. Actually, I’m not sure if I would categorize them as sweets. These little healthy cookies only have half a cup of maple syrup in them for a batch of 30 cookies and use coconut oil for the fat. 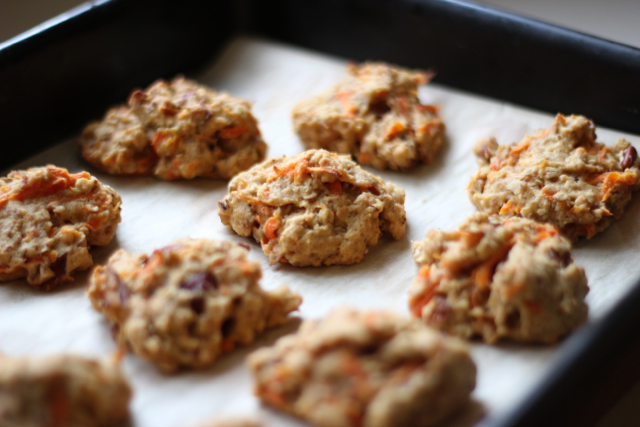 They’re actually very delicious and filled with carrots, oats, flax, pecans, and really won’t make you feel bad for wanting more than one, or two…or five. 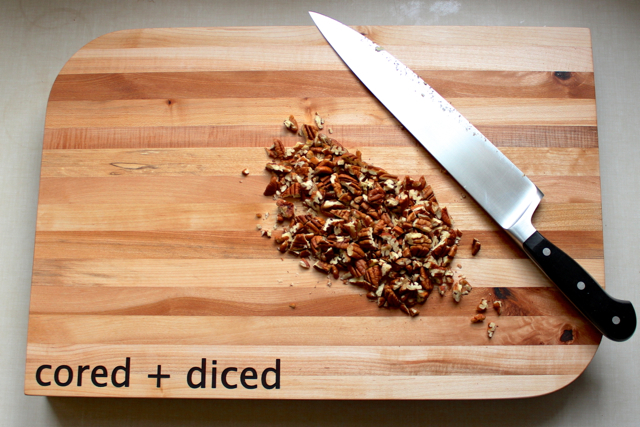 Oh, and can you believe the beautiful butcher block Christoph made for me for Christmas? He got it laser engraved with the blog name! I’ve been sort of too afraid to really use it though because I just don’t want to mess it up! Mix the flours, salt, oats, flax meal, and baking powder in a large bowl. 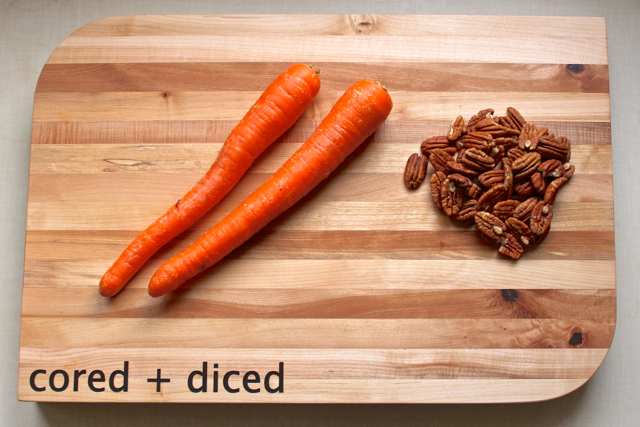 Add in the carrots and pecans and stir. In a small bowl, combine the syrup, oil, and vanilla extract. 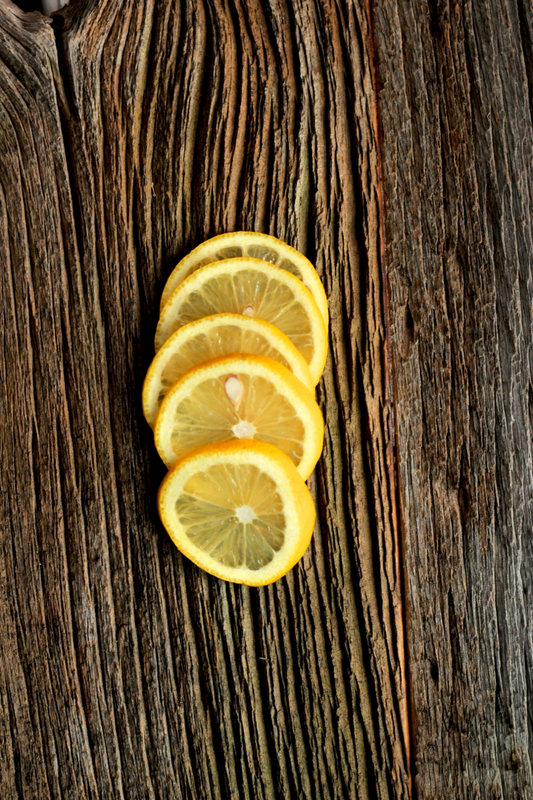 Add this liquid mixture into the dry mix and stir until just combined. The mixture shouldn’t be too sticky. If it is then add a little more flour (about 2 tbsp). 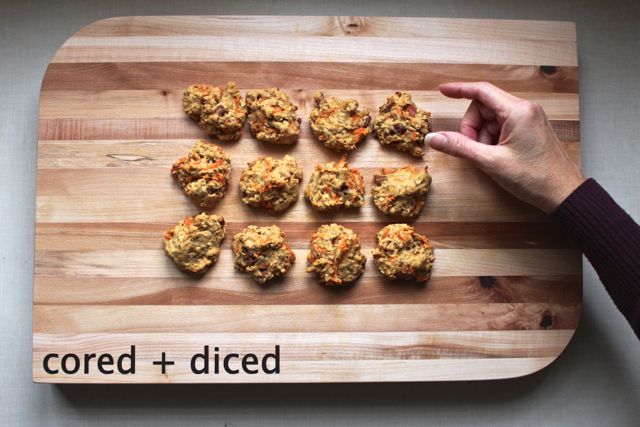 On a parchment lined baking sheet drop tablespoons of the dough and flatten them a little with your fingers. Bake for about 10 minutes or until slightly golden. These cookies are slightly crispy right out of the oven but will soften up when covered in an airtight container. I like to heat them up for a few minutes in my toaster oven at about 300˚F or just eat them soft with a cup of tea. I hate autumn. No let me rephrase that, I hate the flus, colds, and illnesses that come with autumn. Always around this time of year, particularly November, I seem to get sick. No amount of preventative measures, no hand sanitizer, no flu shot, no washing my hands until they crack and bleed seems to ward off the inevitable. Now, being sick in bed at home isn’t all that bad when you’re a kid. Actually, I’m sure everyone has feigned illness once or twice just to get out of school. However, being sick as an “adult” is another matter. The word “adult” actually means “responsibilities” and no amount of sickness will make those responsibilities disappear or seem less important. Not saying that I have a lot of responsibilities or anything but it sure isn’t as fun being sick now that I’m all grown up, now that I’m all grown up and can’t just call in sick whenever I don’t feel like going to work. Even if I really am sick…cough, cough. So, what would I rather be doing? I’d rather be lying in bed, drinking tea, watching The Walking Dead, and eating a cookie. No, not an ordinary, chewy chocolate chip cookie or a sandy, buttery wedge of shortbread, or something like that. I want….a ricciarelli. I don’t actually know how to pronounce these little cookies but I do know how to eat them and I do know that they’re delicious. What they are are gem shaped almond cakes, dry on the outside and chewy on the inside, coated in a dusting of confectioners sugar and lightly flavoured with almond extract and orange zest to enhance their bite. They’re wonderful with a cup of tea or sick in bed with the flu. Whisk the egg whites and salt on high speed of a stand mixer or hand held mixer until frothy. Add in the sugar a little at a time until all is incorporated and the egg whites hold stiff peaks. Mix in the zest and almond extract. Fold in the almond flour and mix until well incorporated. 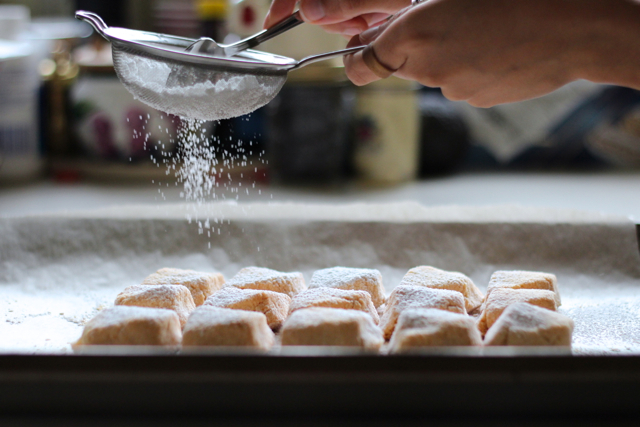 Dust your hands with icing sugar to prevent them from sticking to the dough. Portion the dough into 15 balls while constantly dusting hands with more sugar. Shape the balls into diamonds by pinching the ends and pressing the centres down flat. Space the ricciarelli out onto a baking sheet lined with parchment, lightly cover with another piece of parchment and let dry over night or for about 8 hours. 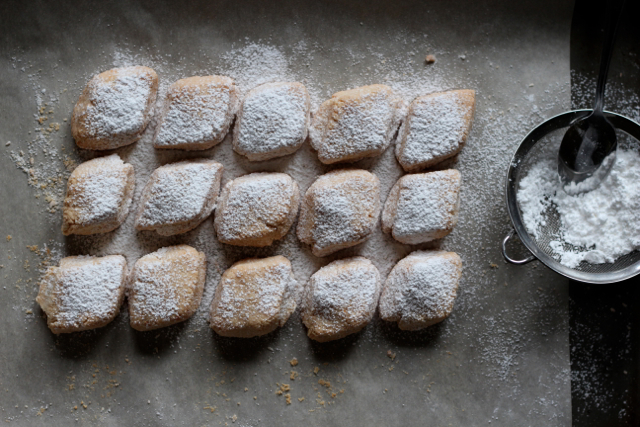 Preheat the oven to 250˚F and bake the ricciarelli for 30 minutes. Remove from the oven and let cool to room temperature before dusting with icing sugar through a fine mesh sieve.